Once again, we have the problem on the internet where a novice flute player (adult amateur) or parent of a flute student wants to purchase an intermediate flute because they are frustrated that their Gemeinhardt 2sp won't allow them to progress. There is a dizzying array of advice given, and other students and amateurs chime in confusing the issue further. 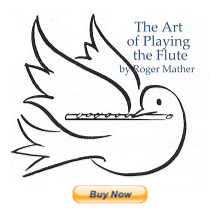 The simple advice is: "Have a quality flute professional assist you in play-testing flutes in your price range.". But for those who want to consult a chart that gives full details on WHY quality and longevity in a flute truly affects the price that you will have to pay for a quality flute playing experience, I've created a PDF article that fully explains. Brands of quality are constantly changing. These opinions are for 2007 only. Thank you for this excellent summary of buying a flute! There is nothing one could add, but all this information will not stop people asking questions about buying a flute ;-) hahahaha! Following one of your former recommendations, I have an Azumi 2000 for 900 $ and this is an excellent flute. P.S. : Nothing brings more joy in your life than a new flute, even if it is mostly a psychological effect. I think it's more than just a psychological effect: I think that the whole game is how fast a flute breaks down. Afterall, it's set as finely as a Swiss watch, and then we rattle it to pieces with a million key motions a day. The real game is "who can make a precision flute, that sounds great, and can withstand all the mechanical wear and tear, and keep on ticking?" ur...keep on "playing without leaking". You might regard this as heresy, but an alternative for beginners might be to learn on a keyless (Irish) flute. While these flutes may be limited to certain types of music, they are very easy to maintain - the delrin ones are virtually bombproof. I started learning on a keyless flute in October. It's been very useful in finding out whether I could play at all, and if I wanted to continue. Now I'm thinking of getting an orchestral / Boehm flute some time in the future, so I can move on to other styles of music. Irish, yes, or a little Yamaha fife! That is another good, keyless alternative for flute beginners, especially little ones. I totally agree about having a decent flute. I got my Altus Azumi 3000RBO just over a year ago, and it has served me so well! I'm so glad we went ahead with it and did it then. It truly does pay to get a quality instrument that will last a lifetime. Thanks for the tips and pointers! Once again your atricles are wonderful. I pulled out this Chart - as it's that time of the year for me (Flute Shopping time). I'm thinking of the Miyazawa PA 202 cause I can get all the gizmos on it and it's Straubinger padded. (pdf docs are such a good way of spreading valuable information for free). Sonare has just introduced a new line of flutes that feature a body made in the US with keys added in Germany. Have you heard anything about the quality of these flutes? I like the Powell head joint so have been considering the Sonare 705. I'll have to look up this Powell Sonare with keywork made in Germany....never heard anything about it to date. The other Sonares I've found to be inconsistent. You have to go through about 20 to find one truly good one, and they seem to go out of adjustment very quickly. Will look into the "German" connection. On the Sonare website it says that the flute's keys are made in Germany. However, whereas it used to say that that bodies were assembled/manufactured in China, the webpage no longer uses the word China at all. You'd have to ask someone who is closer to the company whether or not the parts from Germany are shipped to China for assembly. I know that the headjoints are from U.S. However I still don't like the way they hold up under student use. I have a student with a brand new Sonare 7000 on which the keys have become sluggish and leaky after only two months of irregular use. I think the metal used for the mechanism may not hold up during use. Would like to hear other technicians comment on this. I love your website! As a recent college graduate and flute teacher, I have seen case after case of flutists making poor investments into their instruments. I will certainly give this chart to any parent whose child I teach, who would like to find a new flute for their child. I've seen case after case also. The most unnerving is when a newly arrived college student (wanting to major in performance) has bought an expensive band instrument in August, just before coming to their first lesson, without contacting their new teacher (me). It's so sad when they spend $2000 on an Artley or somesuch, with gold-lip plate, when their old Yamaha 200 would have been fine until we could have shopped properly and tried many different flutes together as part of the lesson on "how to buy--what to buy." So thanks for your comments. I hope other new teachers will print this out too, for parents. Very strange information about the mechanism Sonare made in Germany at Schreiber company. The Sonare already accustomed us to different concepts that do not always correspond to reality. To quote a friend of mine, it seems that the makers started a "flute war" specially at low and middle range instruments, with dire consequences for customers. I´m owner of a Flute Workshop and very closed to German music companies and flute workshops. Tomorrow, i´ll tell you if is it true. Interesting that flutes under the brand Schreiber are made in China, and even in Germany are not famous. They are really famous for their bassoons and clarinets made in Germany. I´ve received the answer which is no as i supposed. Anyway i can send you all details by mail. Dear JJobl, can't wait to hear. Hi! I am an advanced flute student and as I am fastly progressing, I am in need of a new flute! I was looking at many flute brands, and was wondering if you know anything about the quality of the powell sonare flutes. I know that the headjoints are amazing, but i am worried about the body of it. Are di zhaos good flutes? I want a good quality and long lasting flute, but only have a budget of 3k. Do you reccomend any flutes? I'm looking into ones that are solid silver(except for maybe the keys), handmade headjoints and a b foot joint. I found the di zhao 700 and powell sonare ps-601 and ps-705. Are pointed key arms good to have? Thank you so much! I recommend Miyazawa, Muramatsu, Yamaha, Altus, Azumi and Sankyo. If you can find any of the above new or used, in your price range, you can play-test them and see for yourself. Have not tried DiZhao, and have only seen four Sonares, and thought key work was clunky. But obviously with thin, light-weight, long fingers, I prefer Japanese flutes for weight and light key action. Would you happen to know if the Azumi 3000 has poinyed key arms? Yes, I believe Azumi has pointed key arms. Have you looked online for a photo and description? Many thanks for providing all levels of us flute purchasers practical information. I am the father of an 11 year old, first year...first week, flute student. Having been pressed for time and being on an extremely low budget, I bought a second hand Pearl 500ES student flute in like new condition for $175. It is a 'made in Japan' as opposed to Taiwan instrument. If this was an awful decision for whatever reason I will be able to spend a bit more in the near future and get a 200 series Yamaha in shop tested good shape. My question to you Jennifer is this; have I done my daughter a disservice in starting her on the Pearl...and how soon must the change be made to the Yamaha or another as per your suggestion? BTW I had done a bit of research first and steered clear of the 'bargains' such as the Bundys, King, Olds, Reynolds etc. that were notable brasswind but not woodwind companies...now I wonder if I could have saved a good deal and gotten near as much by leaning that way? Any/all advice appreciated. Worry not. The Pearl sounds a good price and should be good for 1-3 years, as long as regularly serviced and maintained from the start. No worries. P.S. The Pearl may even be fine for *more* than 3 years. Your daughter's flute teacher will know when it's time to upgrade, (if your child keeps going with flute), so good to go. Thank you for your summary of buying flutes!! I had in mind 3 flutes to buy. They were Azumi 3000, Miyazawa 402 and the Pearl Elegante 795. Which one would be the best quality of Flute? Thank you for your guide to buy a flute. I had in mind 3 flutes to buy which were the Pearl 795, Azumi 3000, Yamaha 674 and the Powell PS-750. Can you please tell me what is the best flute out of these for quality. Hi Ash, sorry you had to comment three times; they are moderated, so they don't appear until I've read them. Thanks. From those three I would choose the first two, but only because I've never found a Pearl I like. But Azumi is great, and Miyazawa 402 is very good, but more expensive, usually. Be sure and check out multiple "identical" models from the same company brand name. No two flutes are alike, even when they're the same brand and model number. I also see that you asked about Yamaha 600 and Powell. They're okay, but not my favourite. There aren't alot of people reading the comments; this isn't a bulletin board, it's a blog, so maybe only two people a day read here right now. If you want to ask thousands of flute players, try Flutenet Yahoo Group or the FLUTElist. I would think that $6000 is enough to buy a much better flute. How about spending half of it on a used Sankyo Artist or Silver Sonic? Thank you for making this blog. I find the pdf file very helpful. What is your choice between Miyazawa 202, Muramatsu EX and Haynes AF 800 RBEO?